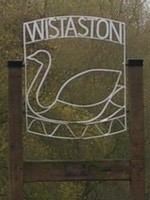 Wistaston Conservation Group works anywhere in the parish of Wistaston, but only with the express permission of the landowner, be it Cheshire East, Wistaston Parish Council, or local landowners. A lot of our work is requested either by the Parish Council, or by local residents, who see a need in the area for our services to improve a local area for either wildlife or for the local residents in general. Cheshire East council have a very good interactive map which you can use to view Parish boundaries and then overlay the map with features such as bus stops, schools, telephone boxes, public rights of way, culture and leisure facilities and much more.